Hey Beach Hostel has the perfect location. We are the only hostel located right on the beach...!! The place is situated on Klong Dao Beach, which is the most beautiful beach in Lanta Island. Just less then 2 minutes walk to the beach where you can snorkel, sun bath or relax on the beach. Most importantly, the hostel is about a minutes drive from the pier and local market, and even less than a minute from the many shops/restaurants/bars and nightclubs, so there really is something for everyone. 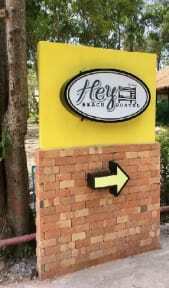 Hey Beach Hostel provides clean and comfortable accommodation in the heart of Klong Dao Beach. The area and hostel is very secure with only guests being able to access. Each room has individual locks and there is a locker in the rooms at no extra charge, and if you want a personal locker, it can be provided for rent. (1) When you check in please show passport or ID card for register. (2) The deposit for a dorm key 200 baht is requested and will return when you check out, but if you lost the key, no refund deposit. - Late check-out without permission will be charged for another night. (1) The minimum age to stay is 18 years old. (2) The maximum age to stay is 60 years old. 6. Front desk opens at 08:00 and closes at 22:00. One of the best hostels I have ever been to. Lovely spot right next to the beach, lovely Jun helping you out on everything, beautiful island and all amenities one would need. Definitely would stay again in this place.